Barend Voorham, an active member of TS-Point Loma, Blavatskyhouse in the Netherlands, at the invitation of Marcos de Resende and the TS-Adyar in Brazil, conducted an outstanding course at the Theosophical Institute near Brasilia in June 2016. Contacts and open dialogues among Theosophists are tremendously important and fruitful nowadays. Freed from worn out prejudices, exchanging views while deepening the understanding of the teachings, all this accelerated through the good work of International Theosophy Conferences, have luckily become a custom. When Theosophists around the world from different Theosophical organizations meet each other more often, a cohesive network is created, which ultimately will encompass our entire planet. In May 2018, Barend met Bruno Carlucci during an event about HPB in Lisbon, Portugal. Bruno is a member of Brasília Lodge in the capital of Brazil. Because Barend had come to Brazil for a family visit, the chairwoman of that Lodge, Maria Alice Fonseca, invited Barend to deliver a lecture on the 16th of January. The title of his talk was Karma and Ahimsa, the Power of Nonviolence. The Blavatsky Bungalow was recently renovated and officially reopened by International President Tim Boyd during the last held International Convention. Theosophy Forward, with kind permission of the Officer in Charge of the Adyar Archives, Jaishree Kannan, proudly publishes some historical back and white photos of the Blavatsky Bungalow which, according to Jaishree, were taken between 1908 and 1915. Enjoy! The next session of the School will be held in beautiful Greece from 13 – 18 October, 2019. The organizers are glad to inform you that the venue for the EuST 2019 will be at the 'Green' Hotel Negroponte in Eretria, a small coastal town on the Evia Island in Greece. Negroponte is a beachfront hotel overlooking the Gulf of Evia with breathtaking views of the surrounding sea, the mountains, and pine forest. Message (unedited) received from Arni Narendran. While Theosophists from all over the world were gathered on the banks of the Adyar River in Chennai for the 143rd International convention, probably the longest continuing and sustained spiritual conference in the world, Theosophists from Mumbai gathered at the Blavatsky Lodge by the French Bridge, in proximity to the Arabian Sea. Extending between 1st to 5th of January 2019, the “ MUMBAI SUPPORT CONVENTION” was organized, convened by the Blavatsky Lodge and Bombay Theosophical Federation, a tradition echoing the spirit of Adyar and for those metropolitan busy bees who are unable to travel to Chennai for whatsoever the reason. At one point of history there used to be an entourage of Mumbai and Gujarat Theosophists numbering as much as fifty attending the Adyar convention by railroad with a spirit of camaraderie and fun, they were all housed in the Blavatsky Bungalow, which is now in the limelight with its new innovated and refurbished Avatar-by the visionary insight of President Tim Boyd and Mr. Michiel Haas, an award winning Architect from Holland, on a journey that took as much as 24 hours. Ironically with as many as ten flights to Chennai from Mumbai, every day and the travel time cut to one hour and fifty minutes, the numbers have trickled down to a few. It was with this in mind the support convention concept was born and remains popular in our calendar of activities at the Blavatsky Lodge. On December 15, 2018 the TOS Adyar helped to sponsor an annual event to support mentally retarded persons. TOS International Secretary, Nancy Secrest, gave the keynote address at the event, which was attended by about 100 people. She found it educational and great fun. The event began with the arrival of the children and a flag raising. We all stood at attention for the raising of the Indian flag, after which, Marja Artamaa, International Secretary of the Theosophical Society, and Nancy shook hands with about twenty children from the Vishwas Special School. Everyone followed, as the children led the way with their banner into the meeting room, where the event was held. Talks followed, given by several sponsors of the event. Various aspects about mental retardation and the care and education of mentally challenged individuals were also relayed to those present from the perspectives of medical professionals, educators, social workers and government representatives. Martin Leiderman comes to the Lowlands once more! This seminar will give the participants a unique opportunity to reach for a deeper understanding of the basis of The Voice of the Silence (VOS), for the purpose of living and sharing its key ideas. The VOS will be explored in a modern, illustrative and interactive way, expanding and challenging our understanding of it. “Testing, 1 – 2 – 3, testing. Check, check.” That’s me on a Wednesday morning, running through a sound check in our webinar studio in Wheaton, Illinois, 30 minutes before the start of Pablo Sender’s popular webinar series, “Walking the Theosophical Path.” I am the webinar coordinator for the Theosophical Society in America, and participants will be logging in soon. In a few moments I will be checking in with Pablo, an internationally-known Theosophical teacher, as he prepares for class from his office at the Krotona Institute of Theosophy in Ojai, California. What is a webinar? At its simplest, a webinar is a seminar conducted on the web – on the Internet. Although you can view a YouTube video on the Internet, or even watch a live broadcast, a webinar goes a step further. You are no longer just a viewer; you are an active participant. You can connect with your teacher and fellow students, ask questions, and make comments. In many cases you can see and hear one another, even though you may physically be located hundreds or thousands of miles away. VERY GOOD NEWS! 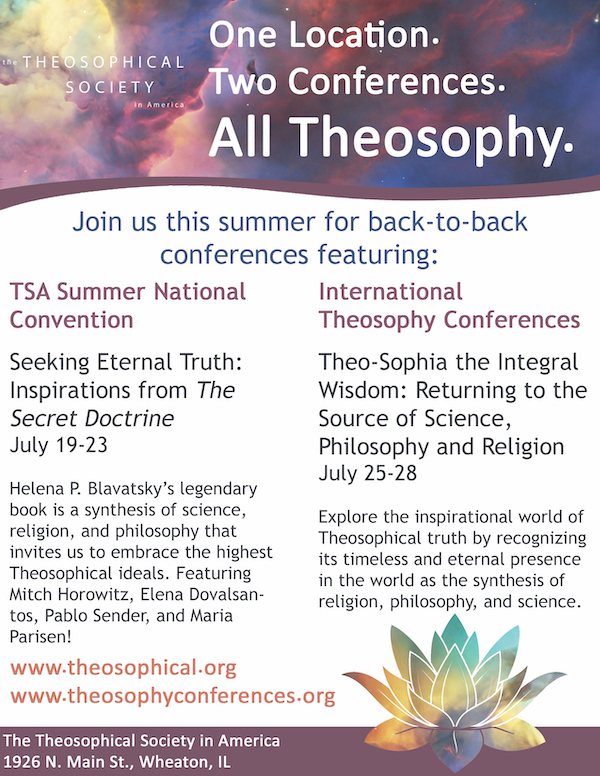 Theme for ITC 2019: "Theosophia, the Integral Wisdom – Returning to the Source of Science, Religion and Philosophy." It should go without saying that the basic work of the Theosophical Society is to help humanity to discover the cause of suffering, which is within the mind, and then learn to become free of that suffering by cleansing the mind. For the mind to cease being the source of problems, it must dissolve the centre that is self which it has created. That self, as Krishnamurti pointed out, can be observed best in relationships and in action. He who abstains from action, as The Voice of the Silence clearly indicates, cannot gain freedom, because he has no means of learning about the intricate and subtle ways in which the self operates and is sustained. One of the main focuses of the International TOS over the past several years has been Women’s Empowerment. The TOS Odisha Region leads the way in these endeavours. Recognition of the work being done has resulted in financial assistance from other TOS countries, namely TS/TOS Italy and the TOS in New Zealand. We applaud the initiative of the TOS Odisha Region and the support given by TOS Italy and TOS New Zealand. The women’s empowerment program in the Odisha Region offers several avenues for training for women to better their livelihood and another to help protect young girls and women from violence. The Mahabharat Group of TOS, Odisha Region has started a project which is a five-year financial assistance programme to poor but meritorious young women for pursuing higher education in college. The annual assistance is Rs.10,000 per student. Currently 25 students are benefiting from this program. A sum of Rs.125,000 per annum (Rs.5,000 per student) has been donated by the members as scholarships in memory of the donors’ near and dear ones. The TS and TOS Italy have kindly extended a matching grant which will ensure the recipients of Rs.10,000 per year for the five year period. The Mahabharat Group expresses its gratitude to the members of TS & TOS Italy for their generous assistance in this worthwhile project. The scholarships were awarded as part of the 5th Regional Conference of TOS Odisha by its Chief Guest, Mr. Abasar Beuria, IFS (Rtd.) former ambassador of India in the presence of TOS India National Secretary, Br. K. Sivaprasad. In addition to a maximum of 2 to 4 special guests who can be accommodated at St. Michael’s House, there are two existing guesthouses. The first one, Arundale guesthouse, is an old structure built way back in the sixties, with a capacity of 10 rooms and ‘shared’ facilities. The second one is the 20-years-old Crystal House with 20 rooms, all having their own bathroom, adjacent to the beautifully designed Crystal Hall dining room. The 87th Annual Session of the Bombay Theosophical Federation was held between 26th to 28th of October. The first two days at the Blavatsky Lodge, French Bridge venue and the last day at the Juhu Theosophical Colony by the Sea. Read more: Good News from the Blavatsky Lodge, Mumbai-India.